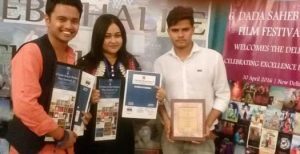 Massco Media,a mass communication institute situated in Noida,Uttar Pradesh has made a big win at 6th Dada Saheb Phalke Film Festival. MassCoMedia’s film ‘Devbhumi-The Land of God’ has won the first prize in Special Jury Mention in the best documentary category on the special occasion of 6th Dada Saheb Phalke Film Festival 2016. The film festival was held at Tivoli Grand, Alipur, Delhi in which more than 800 films were received for screening but only 250 films were shortlisted. Film ‘Devbhumi-The Land of God’ is produced by MassCoMedia students- Rahil Kamal, Chirag patel, Avinash Singh, Navneet Raj. “Cinema is the ultimate pervert art. It doesn’t give you what you desire,it tells you how to desire.We are honoured to receive this award,this award shows the exemplary talent our institute has.I have always believed that action is the foundation key to all success and this award is an example of that.We are thankful to the audience and critics for their tremendous appreciation and love,” Divesh Nath,Founder,MasscoMedia said.